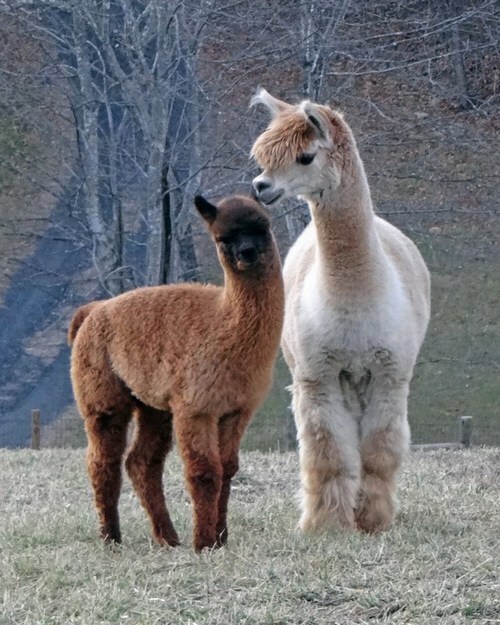 Landmark Farm Alpacas is a small, eco-friendly, working alpaca farm in Grassy Creek in Ashe County.&nbsp; The farm is owned and operated by Ralph and Rachelle Bridges.&nbsp; Originally from Florida, they purchased their first alpaca in 2008 and now have a herd of 15. They transformed a forested 18 acre tract of land into a beautiful farm in a park-like setting, with lush pastures and a barn. They chose to raise alpacas because of their gentle and curious dispositions, their ease of care compared to other livestock, their luxurious fiber, and because they are just so cute! Farm tours are offered, by appointment, to introduce visitors to these delightful fleece-bearing creatures. The farm shears the alpacas once a year in the spring, and then has the many multi hues of fiber processed into yarn and made into luxuriously soft and warm garments, for infants to adults. The farm&rsquo;s Fiber Shop has a wide variety of products made from alpaca for sale, including yarns and roving&#39;s, rugs, scarves, caps, gloves, and socks, children&rsquo;s toys and teddy bears, and wonderful alpaca novelties. In June and October, there are often newborns to be seen and petted! If you are interested in buying alpacas let them know, they will be happy to show you which ones are for sale. Give them a call and go meet the alpacas! Are you looking for Ashe County Real Estate or perhaps Mountain Acreage NC? Let our Ashe County Real Estate Agents help you find&nbsp;North Carolina Mountain Land&nbsp;and North Carolina Mountain Real Estate in Ashe County NC&nbsp;and&nbsp;Alleghany County NC. We list and sell Blue Ridge Parkway Real Estate and are very knowledgeable about the areas of West Jefferson North Carolina&nbsp;and all around the Blue Ridge Parkway NC. Check out our website (www.a1mountainrealty.com) for all listings of West Jefferson NC Real Estate and&nbsp;Land for Sale in West Jefferson NC&nbsp;or if you don&#39;t find anything in our listings of Western North Carolina Mountain Property then check out the Western North Carolina MLS. ← August Real Estate Sales!